Making ID Cards has Never been Easier! 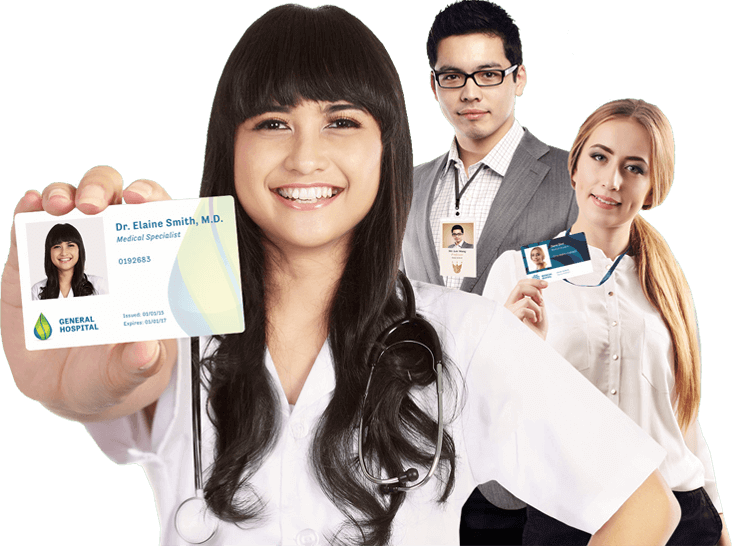 Do you need ID badges for your Company, School, or Organization? Create your design with our state of the art Badge Maker and get your cards as soon as the next day! IDCreator has no pay to unlock features, setup fees, or minimum order quantities. Create a Free Account and customize your badge with text, images, shapes, colors and more right away! Start designing badges on your computer of tablet right away with no software downloads or additional requirements. We do recommend against trying to design badges on your phone as the many available design options can be hard to navigate on the smaller screen. We offer 200+ proffessionally made design templates organized into suggested categories to the right. You have full control to add, remove or modify any element on these designs. If you like one of our designs as is, simply replace the placeholder text and images with your own and add it to the cart. If you already have a specific design in mind or are looking for a completely unique design we also provide the option to Start from Scratch, just choose a Vertical or Horizontal blank canvas to start with. Creating ID Cards for several people? Add Smart Fields to your design for any text and images which will change for each person. Then add your members one by one or in bulk with a spreadsheet upload. This allows you to create thousands of ID cards in minutes! Smart Fields are free to add, learn more here. Our goal is to take care of all your identification needs while saving you time, effort and money. Our Support Articles have step by step instructions for several design functions and common questions. Our dedicated customer service and sales team can also help with special requests, custom quotes and out of the box solutions. Feel free to reach out via E-Mail, Toll Free Phone or with our Contact Form. We love to hear from our customers! For Domestic Orders over $50! ©Copyright 2006-2019 by Project Arcadia LLC. All Rights Reserved.